Gwen? Who the **** is Gwen? Glad you asked, and let me quickly introduce you. 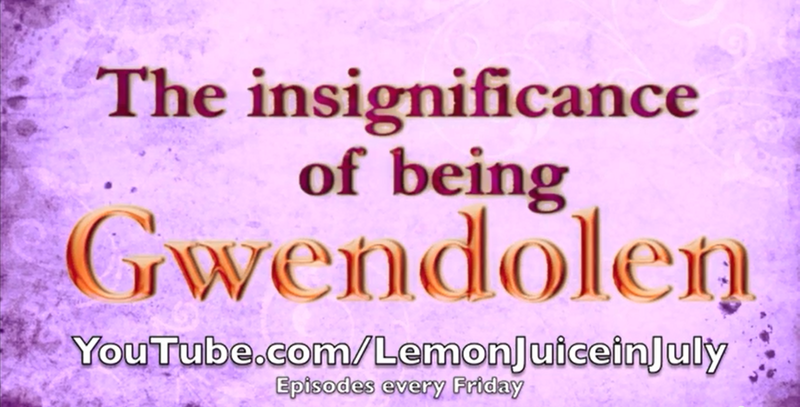 The Insignificance of Being Gwendolen is a transmedia project I am currently involved in, so I’ll just take a few minutes to give you a quick sign that I’m still alive because the blog has suffered a lot due to end-of-the-semester stress and I apologise for that. Being Gwen – I’m Transmedia Supervisor, yay – which takes a lot more time and a much bigger agenda than it sounds like, but since I am a workaholic anyway and get bored by other things way too easily that’s fine. Essentially, my job is to keep track of what’s happening in both the vlog and the blog and tackle everyone as soon as I see that something might overlap or contradict badly. Luckily, nobody has to be tackled so far so nobody has been hurt in the process, but I can’t make promises for the future. The project is a modern-day adaptation of Oscar Wilde’s The Importance of Being Earnest, and it’s the brainchild of the director and ex-fellow student of mine Lisa-Theresa Downey Dent (who you can and should also follow on Facebook to get more exciting updates)! She’s also playing Gwendolen in the vlog and editing and all, so she’s generally just a very busy person. Aside from the vlog, there is also a blog from the perspective of dear Cecily written by another ex-fellow student of ours, Ilse Ras, and of course everyone is absolutely obsessed with Ernest, as we know. So what’s the big deal? Well, Gwen and Cecily are both struggling with life, which of course is something we can all identify with right now, near the end or even after our studies. But of course things get complicated when men get involved as well, and… well. You probably know the story, so it’s due time you check out our awesomeness and give us some love, feedback, comments, whatever comes to mind! Virtual hugs are also very much appreciated because everyone needs hugs. The vlog is updated every Friday and we’re not even close to being finished, of course, and the blog is updated once a week on Tuesdays as well. You can access the blog here, and just go ahead and follow this link or click below to access the vlog’s playlist, and catch up on all the craziness. You know you want it. May 17, 2014 in Creativity, Storytelling.